This handsome boy is Duke. 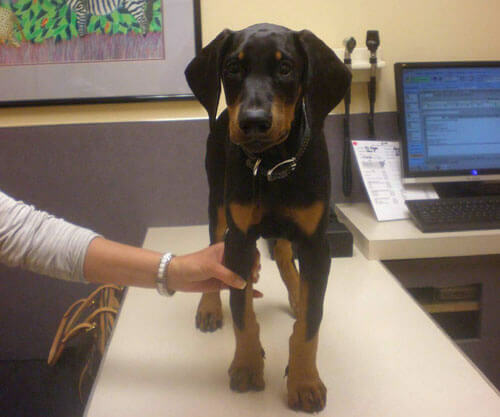 Duke is a young Doberman pinscher who came in to be neutered. Unfortunately, Duke was cryptorchid which meant that one of his testicles had not descended into his scrotum and was still in his abdominal cavity. Historically cryptorchid pets required an exploratory surgery to find the retained testicle. Duke however was fortunate in that we were able to use the laparoscope to find the un-descended testicle. A small incision was made near his belly button and the laparoscope was inserted into his abdomen. The testicle was quickly visualized and removed via another small incision in his abdomen. Duke was able to heal quickly because of the minimally invasive procedure and was back to his old self in no time. Congratulations on being this month’s Pet of the Month.